“Natural gas is one of the cleanest, cheapest and most efficient sources of energy. Alberta accounts for 68 per cent of the natural gas produced in Canada.”* But how much drilling for natural gas has occurred in Alberta during the downturn? 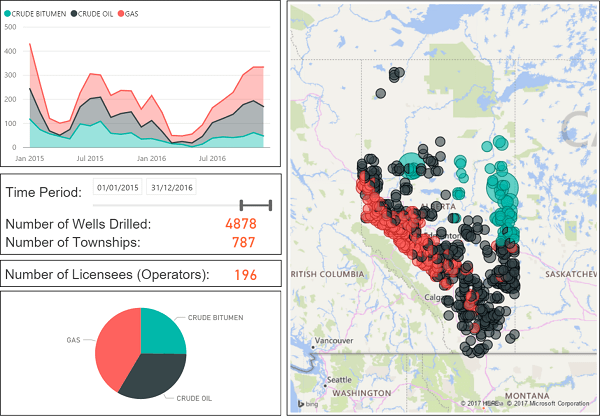 The amount of drilling is approximated through Alberta drilling activity records between 2015 and 2016. 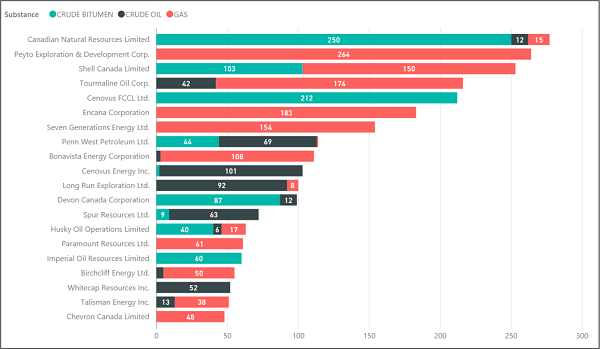 For instance, 41% (2,000 ) of all wells drilled (4,878) in that period were licensed for Gas (indicated by red colour in the charts below). The remaining 60% of all wells drilled were licensed for oil (indicated by grey) and bitumen (indicated by green). The red portions of the chart below show that a number of companies devoted some of their 2015 and 2016 drilling schedules to gas wells. In fact, gas well drilling was spread across 81 of the 196 operators who drilled during that period. Peyto, Encana, and Tourmaline were the top 3 operators of gas wells drilled (indicated by red portions of the bars). Drilling activity had dropped sharply along with oil and gas prices since 2014. By combining the Drilling Activity data from the AER (ST49) with the Well Licenses Issued (ST1); we can see the licensed substance for each drilling event. Previous PostPrevious Is the Number of Alberta “Orphan” Wells Growing? Next PostNext Is CNRL Continuing to Drill for Heavy Oil?